Hawaii missile attack: How it was mistakenly warned. Hawaii mistakenly warned of missile attack. 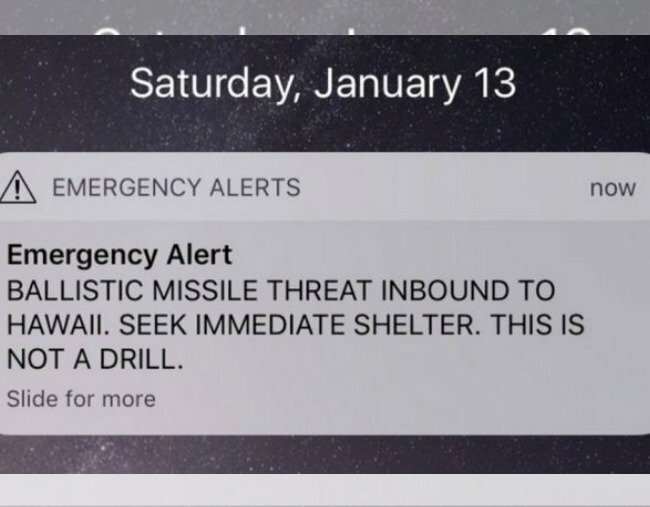 A push alert that warned of a ballistic missile heading straight for Hawaii and sent residents into a full-blown panic on Saturday was issued by mistake, state emergency officials said. The emergency alert, which was sent to cellphones just before 8:10 am, said in all caps, “Ballistic missile threat inbound to Hawaii. Seek immediate shelter. This is not a drill.” The Hawaii Emergency Management Agency tweeted that there was threat about 10 minutes later. But a revised push alert stating there was no threat went out sometime after that. NORAD is a US-Canada joint command that conducts aerospace warning, aerospace control and maritime warning to defend North America. At the PGA Tour’s Sony Open on Oahu, Waialae Country Club was largely empty and players were still a few hours from arriving when the alert showed up. The tournament staff urged the media centre to evacuate. Staff members at the club streamed into the clubhouse and tried to seek cover in the locker room, which was filled with the players’ golf bags, but instead went into the kitchen. “I woke up and saw a missile warning and thought ‘no way.’ I thought ‘No, this is not happening today,”‘ Malapit said.